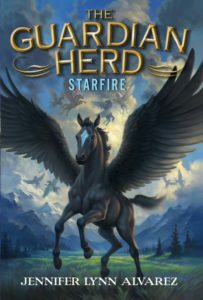 Guardian Herd: Starfire Archives - Joelle Delbourgo Associates, Inc.
Meet the Guardian Herd Cover Artist! Jennifer Lynn Alvarez ran this great interview with the artist who drew the eye-catching jackets for her GUARDIAN HERD series from Harper Collins Children’s. We loved it so much we begged her to let us share it with you. Find out how David brought our hero Star to life. Jennifer: At what age did you know you wanted to be an artist? David: I knew from a pretty early age. It was probably around 4th or 5th grade, when I realized that becoming a professional basketball player was out of the question. I guess it was really in college, when I chose to major in illustration, that I actually solidified the decision. Jennifer: What is your favorite medium for expression and has it evolved over the years? David: In high school it was Prismacolor pencils. Then, in college I did most of my illustration assignments in acrylic paint because the fast drying time meant I could get the assignments done on time. After college I got introduced to digital painting and never went back to the acrylics again. Everything that I was trying to achieve with the acrylics worked so much better with the digital media. So now all of my illustration work is done in Photoshop. But I do try to keep one foot in the door of traditional painting, so I do a lot of studies in oils to keep my skills up. Jennifer: How did you turn your passion for art into a career? David: Basically, it’s been about getting an education and then continuing to learn my whole life. I studied illustration in college, so I learned some good fundamental principles about drawing and painting, as well as communicating ideas through images. And I learned about being a professional and meeting deadlines and keeping clients happy. After college, I knew that illustration jobs would be inconsistent so I got a job as an artist for a video game developer, which has been great because that has meant working with many other talented artists as a team and learning from them. And of course, working with 3D software is a different animal than 2D art, but much of it overlaps in terms of what you need to know. I’ve basically had to learn how to be a landscape painter, except that the landscapes are virtual 3D worlds. So I think the knowledge and skills I’ve gained as a video game environment artist have helped my illustration career and vice versa. Jennifer: How did you become the cover artist for The Guardian Herd Series? David: The art director at Harper Collins had hired me before, but on a completely different kind of subject matter. As she considered me for this job, she asked if I was any good at painting animals and asked for some examples, and I told her that I was okay, but that I was probably weakest at horses. Of course, horses were exactly what she needed. And she agreed with me that my horses were not my best work, but for some reason she took a chance on me anyway. I immediately went and got some books on horse anatomy and started trying to figure it out. In hindsight, I think I was probably equally bad at drawing all animals. It’s just that horses are animals that humans are really familiar with, and have such specific proportions and musculature, that people can always tell when artists get them wrong. If you draw a dog wrong, you can just say it’s a different kind of dog. 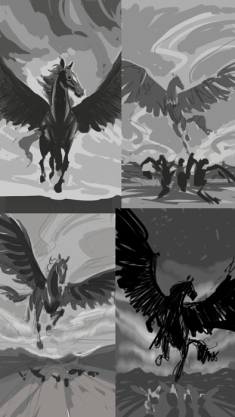 Jennifer: Please describe your process, from conception to delivery, for creating a Guardian Herd book cover. David: The art director gives me a description of what they want to see on the cover as far as characters and what kind of setting they want. Then I do several sketches to try and turn all those elements into a composition, taking into account where the title and author’s name will be. Those first sketches are usually so rough that no one else would understand them. Lately I have been doing those kind of sketches on my phone. I then pick out a few that have the most potential and make more finished sketches of those ideas to send to the art director. She will then review the sketches with the editor and author (you!) and then either ask for changes or give the go ahead on the one that they like best. Then I will do color studies and work out the big picture before rendering any details. I will have to do research and gather reference materials, in this case, lots of pictures of horses and wings. I have used toy horses for reference too since the photos usually don’t have the right kind of lighting. So sometimes I set up the toy horse with some makeshift paper wings to help me figure out what the shadows need to do. Then, from that point on, it’s just a lot of hours of painting time to refine and finish it off. Jennifer: Your perspectives on the covers are dramatic! Can you give readers any tips on how to draw interesting pictures? David: As far as perspective goes, on both of these Guardian Herd covers so far I have dropped the horizon line lower so it feels like you are looking up at Star which makes him feel more heroic. There are so many potential answers to the question of how to make interesting pictures. Coming up with an interesting idea that is worth the time spent creating it is certainly crucial. Doing several rough sketches to get at the best possible idea helps. Making your image clear and legible helps. For example, it helps to have a clear focal point that is the most important thing in your picture and then have all the other elements complement rather than compete with that main focal point. I believe that contrast is a big key to making things interesting. Our brains naturally look for contrast to make sense of things. And not just contrast of light and dark but just about everything you can think of has an opposite that you can use to set it apart and make it stand out. Of course, not everything should stand out. Only the important things. But if you want something to feel light, surround it with some dark. If you want something to feel big, put something small next to it. Try to keep variety in your shapes and not make everything too similar or monotonous. Jennifer: I’m hosting a giveaway of an ARC and a pegasus toy to readers who submit a drawing of a pegasus. Do you have any specific tips/advice on how to draw horses and feathers? David: Well, start by getting the best reference materials you can get. You may not be able to see all that you need to understand in a photo of a horse, so a book on horse anatomy or a diagram of the muscles of the horse can be helpful. With feathers, it seems to be a little like drawing fingers or hair. If you are drawing a hand, it works best to mass in the fingers as a group first before trying to depict each individual finger. And with hair, it’s the same thing. You draw the mass of hair and then define only as many strands of hair as you need to in order to show that it’s hair and no more. With the feathers, start with the shape of the wing as a solid mass with the structure of the bones underneath in mind, and then add the feather detail on top of that foundation. And remember that you don’t have to define each feather with equal importance. Pick a few main ones to be the ones that tell the story. Jennifer: How important has the computer become in the world of art? David: It’s extremely important. And along with computers I would list smart phones and tablets and any electronic device that can be used to either create art, or view it. But the thing to remember is that the hardware and the software are just tools. The music is not in the violin. It has to come from the musician. So a software expert with no artistic training probably won’t create something as beautiful as a good artist with little software training might be able to. So I always tell people to use the software to express their designs rather than to let the software dictate the design. Jennifer: Can you recommend any software programs that budding artists might want to learn? David: I really only work in Photoshop for my illustration work, although I sketch in the Sketchbook Pro app on my phone. I have messed around with the Brushes and Art Rage apps on my iPad. I think the kids probably know better than I do what the cool new painting apps are. I always recommend that kids get really good with real pencils and paints before getting into digital art because I think that foundation really helps. David: I just want to say thanks Jennifer, and that I have really enjoyed doing the illustrations for the Guardian Herd series, and I’m excited for the next book! I hope that the fans of the books enjoy the illustrations and feel like they do justice to the characters. I look forward to seeing some cool fan art soon! ARTIST BIO: David McClellan grew up near Portland, Oregon and then studied illustration at Brigham Young University in Utah. 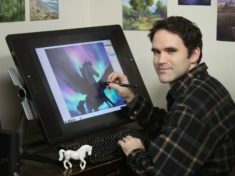 In addition to illustrating books he works as an artist for Disney Interactive Studios, where they make the video game, Disney Infinity. He still lives in Utah with his wife and four boys. You can see more of his work at his website and Instagram. Also you can check out Jennifer and all things Guardian Herd including contests, bonus materials, and upcoming appearances on her website. 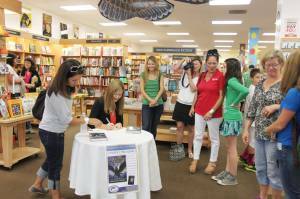 Jennifer Lynn Alvarez hits the road with The Guardian Herd! Jennifer Lynn Alvarez is on tour in September/October with her new middle-grade series THE GUARDIAN HERD: STARFIRE, which released on 09/23/14. 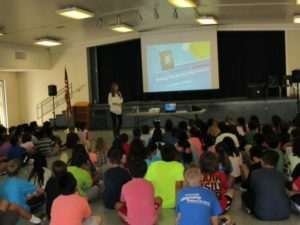 Jennifer is visiting elementary and middle schools around the country for two weeks, followed by a round of school visits with the HarperCollins “Class Acts” school tour. At her first in-store signing, THE GUARDIAN HERD: STARFIRE sold out in fifteen minutes! While it pained Jennifer to watch children leave empty-handed, she will be returning to the same store in October to sign more books. 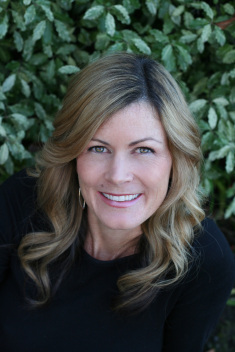 For more information about Jennifer and her new fantasy series for tweens, please visit her website. An action-packed debut novel in an exciting new tween fantasy series, perfect for fans of series like Warriors, Survivors, and Guardians of Ga’Hoole.Once every hundred years, a black foal is born, prophesized to either unite or destroy the five herds of flying horses that live in the land of Anok. This foal is fated to become the most powerful pegasus in all of Anok. Star is this black foal.Even though Star has malformed wings that make him unable to fly, the leaders of each herd will take no risks. They will execute Star on his first birthday. With the help of his friends, Star must escape the clutches of the powerful leaders. His epic journey of self-discovery turns into a battle between good and evil that will keep readers eagerly turning the pages. The Guardian Herd: Starfire pubs today! We want to wish a happy book birthday to the one and only Jennifer Lynn Alvarez. 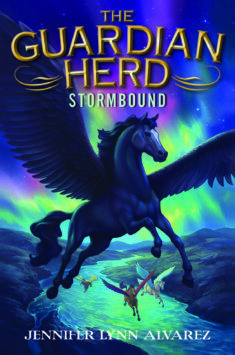 Her fantasy-adventure middle-grade debut THE GUARDIAN HERD: STARFIRE pubs today. 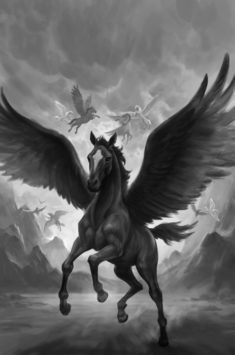 We can’t wait for you to meet Star and his friends, the pegasi of Anok. Book 2, STORMBOUND, is coming in April! We’re so pleased that Jennifer Lynn Alvarez’s middle-grade debut The Guardian Herd: Starfire (pubbing September 23rd from Harper Children’s) has been chosen for the prestigious ABC Best Books for Children 2014. Of 1000’s of books considered only 200 are chosen. Congratulations Jennifer!